ShowBE is an Expert Advisor that helps you to manage your trades. With the default settings, EA analyzes and displays information about the total opened position for the current currency pair. 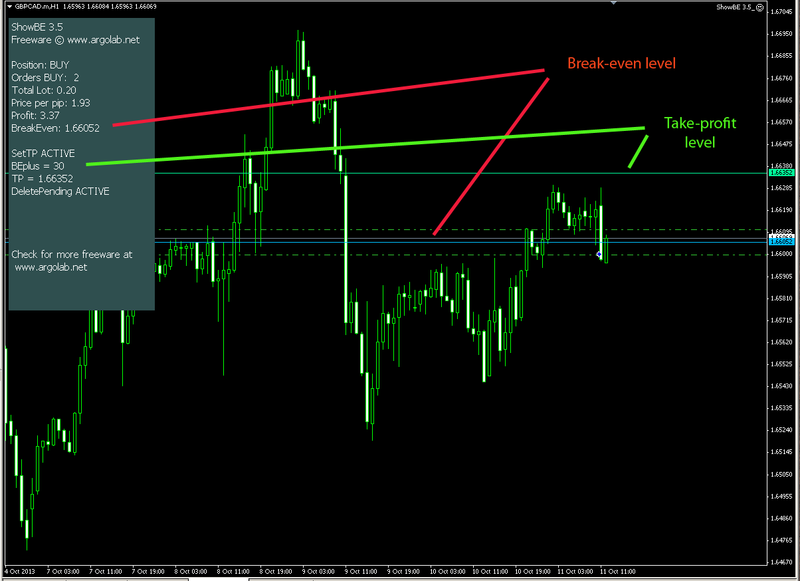 In particular, it calculates and shows the break-even (BE) level. The additional features of the EA allow you to set up and update the take-profit and the stop-loss levels of the total position. With the SetTP option activated, EA will set the take-profit levels of all open orders to the BE level plus (minus) the given number of pips. If the number of open orders changes (e.g., a pending order is triggered), EA will recalculate the BE level and modify the take-profit levels accordingly. This option is active only if there is more than one opened order. The CloseBE feature will do the same as SetTP, but without setting the take-profit levels of open orders. CloseBE works as a virtual take-profit, closing all orders when the total profit reaches the BE level plus (minus) the given number of pips. In this way, your broker has no way of knowing when you are going to close your orders. The level at which the orders will be closed is shown graphically on the chart. If both long and short orders are present, they will be closed by overlapping, thus saving the spread. The MaxDD and MaxDDPerCent features will close your orders when the open drawdown on this pair reaches the prescribed level (in currency units or in percents of the account balance). These two features work as a virtual stop-loss, restraining your losses in cases when the market moves against your position. • Delete all pending orders after the market orders are closed by take-profit. • Remove the take-profit and stop-loss levels of individual orders when the position is fully locked (the volume of the long trades equals the volume of the short trades). • Close all orders immediately, if a CloseAllNow flag is set. 1. The breakeven level is now calculated with taking into account commissions and swaps of opened orders. of base currency (variable TProfit) or in percents of the deposit (variable TProfitPerCent). 4. An option is added that switches off the background of the information panel. To do this, set show_box=FALSE. at breakeven level, but at breakeven + BEplus pips). 2. EA can work separately with buy or sell orders. EA writes in the information box which orders are taken care of. This function moves the stoploss of the basket to the BreakEven point when the basket profit reaches BreakEvenTrigger pt from the BreakEven level. UseBreakEven (TRUE/FALSE) – use BreakEven function. BreakEvenTrigger – trigger (in pt) for Breaking Even. 2. WorkWithSingleOrder (TRUE/FALSE) – If FALSE, the functions CloseBEplus and SetTP will work with baskets that consists of two or more orders. If TRUE, the functions CloseBEplus and SetTP will work also with single order. 3. comment_fontsize – text font size. 4. The button in the left upper corner is added that removes/resumes the information panel. First of all, thanks a lot for your great EA.. It works perfectly, when marek goes against us, and we add new trades, to our losing trades.. But what I think to improve when we use pyramid trading (adding new trades to already profitable trades)..
Is it possible to improve this EA, by adding new feature.. Lets say, that I have few open trade is same pair.. Entrace in different level, so profits is different for all trades. What I mean, that EA would calculate total SL, to protect profit and trail this profit, mvoing SL for all positions.. If you think it;s good idea, let me know..
We just forgot to put the latest EA version (4.1.0) in the English thread. I will now update the first post. I use this great EA quite long time.. Thanks Argolab Team. Just updated your last version 4.1.0 and it doesn't work.. I have 1 lot long, and 2 lot of short..
Set TP=true.. and EA calculate right BE level in 'window' but doesn't set these SL and TP in trades..
Have someone else tested it ? This part is not changed; there should be no difference. No one else complained. Have a look in Experts tab for errors. That's is really strange.. EA works perfect on E/U chart.. and doesn't work in G/U pair ! I use same settings for all pairs , and only works with E/U..
no TP and SL set in .. Yes, it is a small bug, present in all versions. It happens if you have 1 sell order and basket is sell. Open another sell order and TP will be set. just opened new sell trade, and it works now.. Thank You ! EA is updated to ver. 5.0.1, see the first post for details. Can this EA handle all orders from another EA in all currencies or do I need to open it on a chart for each currency? EA handles orders of one currency pair only (== the chart symbol). Which is natural: you cannot define the breakeven level of the basket of orders on different pairs. If Magic = 0, orders with any magic (and without magic) are handled. If Magic is nonzero, only orders with this magic are handled. In addition, you can force EA to handle only buy or only sell orders by BuySell selector in the settings. Will there be an update to work on comments as well? Thanks for this EA, I'll test it tonight. We update our EAs regularly. Feedback from users is always welcome. Some of the comments are used in the updates, but not all of course. Firstly, thank you for this EA it is very cool! I am wondering if you could help clarify how the MaxDD (in units) works... I had 3 trades open all at different opening prices and I set the MaxDD to 126 thinking that the SL would be set at the price where the combined drawdown in pips for all 3 trades was equal to 126. However, the trades closed when the combined DD was equal to 90 pips. Is it possible to show the SL on the chart when this option is being used? OR at least show the calculated price in the comment box as is done for the BE? MaxDD sets the maximal drawdown of the whole basket, and not in pips but in units of currency of your account (in $, essentially). MaxDDPerCent does the same, but in %s of your deposit. This option is meant as a safety measure: if the total DD reaches this value, we just quit. You can assign individual stop-losses to your orders, no problems with that. We'll think about it. For now, you can read in infobox "the price of the pip" for your basket. If the price of the pip is, say, 10$, this means that 100 pips against your basket correspond to additional DD of 1000$. I'm using latest 5.1.0 and it's not working for BuyOnly only for SellOnly, BuyAndSell works, too. If you think something is not working attach screenshots and content of Experts tab (logs).